Choose Chapter... 1. Early Days 2. Teenage Yogi 3. Divine Leadership. 4. Uplift of Women. 5. Disciples. 6. Ascetics. 7. Scriptures. 8. Mandirs. 9. Philosophy. 10. Teachings. 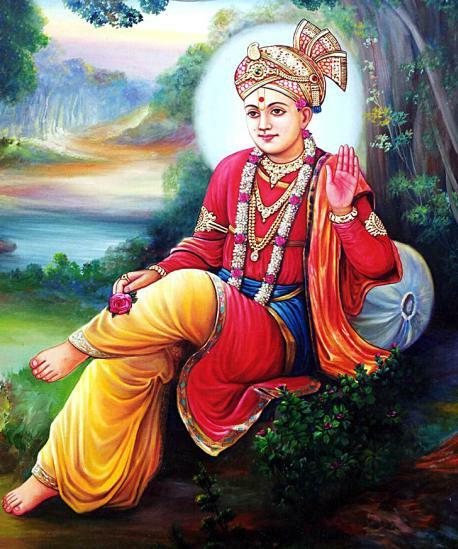 Swaminarayan (Svāmīnārāyaṇa, 3 April 1781 – 1 June 1830), also known as Sahajānand Swami, is the central figure in a modern tradition of Hinduism known as the Swaminarayan Hinduism, a form of Vaishnavism, founded and most popular in Gujarat state of India. Bhāratvarṣa - India has been graced since time immemorial by incarnations, rishis and sadhus. Whenever evil elements stifle Dharma - righteousness, God incarnates on earth to re-establish Dharma. Lord Rāmchandra in the age of Tretā and Lord Krishna, at the end of Dvāpara, are the two most notable. Five thousand years after Lord Krishna passed away, into the age of Kali - darkness, the ogre of evil defiantly arose out of its banishment, once again darkening the minds and hearts of the people, its grip suffocating eighteenth century India. Severing vital nerves and arteries, it deprived the land of life-giving moral and spiritual nourishment; hindering healthy growth of the eternal values of Dharma, Satya - truth, Ahimsa - non-violence and Brahmacharya - celibacy. Thus He incarnated as Ghanshyam on 2nd April 1781 (Chaitra Sud 9, Samvat 1837), in the rustic village of Chhapaiya, in northern India, to a Saryupari Brahmin pundit named Hariprasad Pande. He was the second of three sons; Rampratap, the elder brother and Ichharam, the younger. His mother, Premvati was lovingly known as Bhaktimata, and father Hariprasad as Dharmadev. "Since He is born in the Karka Rāśī (sign of Cancer in the zodiac), His name will be Hari. His dark complexion will also confer the name Krishna and Ghanshyam. He has the virtues of tapas (austerity), detachment, yoga, Dharma, leadership, truth and viveka (power of discrimination). Therefore people will also call Him Nīlakaṇṭha. "He will establish Dharma on earth and remove pain and misery from people. He will be famed all over the land. He will also induce people with samādhi (a state of spiritual trance). He will lead people to the path of God." About this time, Dharmadev decided to test Ghanshyam's innate instincts: He placed a gold coin, a scripture, and a sword on the floor. On all fours, Ghanshyam toddled towards these objects; trying to lift the scripture, avoiding the other two. Dharmadev jubilantly lifted and hugged Him, deducing that He would surely attain scriptural learning. In a town named Ballampaddhari near Chhapaiya, the state king had recently camped with his army. Two of the soldiers were Dharmadeva's relatives. Therefore Dharmadev decided to visit them with Rampratap and Ghanshyam. When they reached the encampment, they heard goats causing a commotion in one of the tents. Dharmadev peeped inside. Horrified at what he saw, he quickly turned back. But Ghanshyam, observing Dharmadeva’s ashen face, also walked up to the tent in curiosity. He saw the king supervising the slaughter of the goats for food. Ghanshyam walked away in pain. He then induced all the elephants and horses of the army to break tether and stampede towards the tent. The king bolted out first, and heard a mysterious and authoritative voice, which commanded him to beg forgiveness for the killing, from the Lord who was standing in the form of a little boy nearby. The king saw Ghanshyam with Dharmadev and Rampratap. He bowed at Ghanshyam's feet, begging for reprieve from the maddened elephants. Ghanshyam not only made him promise to renounce animal slaughter but to propagate Ahimsa (non-injury in mind, action and speech for all living creatures) in his kingdom as well. The excited elephants and horses calmed down instantly, returning to their tethers. On another occasion, Ghanshyam revived a basketful of dead fish in a lake. He then instructed the surprised fisherman not to commit such sin by changing his means of livelihood. Having lived in Chhapaiya for a few years, the family moved to nearby Ayodhyā, when Ghanshyam was five, to escape harassment from evil people. With a marked inclination for devotion and a remarkable disinterest towards material pursuits, Ghanshyam loved to visit Mandirs every morning and evening. After darśan (sight) of the mūrtis (icons), He would listen to the narration of divine episodes from the Rāmāyaṇa, for this ancient sacred city is revered as the birthplace of Lord Rāma. Ghanshyam's divine disposition often startled but pleased the family. Once engrossed in Kaṭha (scriptural exegesis), He forgot to return home. Rampratap, His elder brother searched for Him in the city's Mandirs. On seeing Ghanshyam in one, he asked Him to return home with him. The kathā nearly over, Ghanshyam suggested that Rampratap, in the meantime, have darśan in the neighbouring Mandir while He Himself sat through to the end of the Kaṭha. Arriving at the nearest Mandir, Rampratap, to his astonishment, saw Ghanshyam there as well. He then dashed from one Mandir to the next. He saw his younger brother in each one! Other miracles included: walking on water across a lake, and defeating adult wrestlers in contests. At the age of eight He commenced Sanskrit studies under Dharmadev after being invested with the Yajñopavīt rite. By the age of ten, the child prodigy had mastered the Vedic scriptures. Around this period, He accompanied Dharmadev, who was to chair a scholarly debate in Benares - the renowned centre of knowledge (Jñāna) in India. When a tie arose, Ghanshyam, with Dharmadeva’s permission, gave a brilliant exposition, convincing the scholars of the soundness of the Viśishṭādvaita philosophy (qualified non-dualism). Soon after returning from Benares, both parents passed away. Ghanshyam then left Ayodhyā, for the Himalayas, to begin His life work of establishing Ekāṅta Dharma, on 29th June 1792 (Ashadh Sud 10th, Samvat 1849). He was only eleven years old. His mendicant garb consisted of only a loin cloth. He carried an icon of Bal Mukuṇḍa (the Lord) and His miniature diary containing the gist of the scriptures, the result of His studies with Dharmadev.